Salmon Is My BFF (Best Food Friend)! If I were to consider all the foods we have to choose from and make one of them my very best food friend, it would have to be Salmon. By far it is the most interesting, fun, versatile, hard-working and good-for-us food out there. 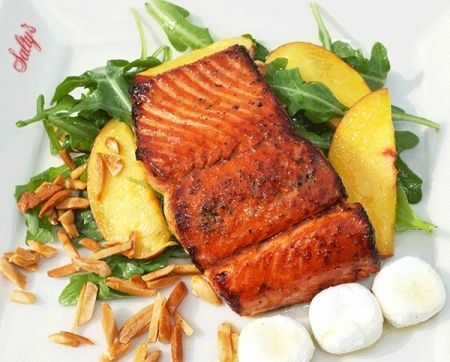 Of course we all know that Salmon is delicious and its versatility allows us to prepare it in so many ways. It’s always fun when our wild Salmon friend comes around; every dinner out, party or barbecue is all the better when it attends. Consider the Copper River Salmon that has just arrived at Salty’s. This hard-working Salmon goes the extra mile. “The Copper” swims 287 rugged miles of frigid, steeply sloped, high-velocity river with its schoolmates. Talk about dedication and good character! Because this hard-working fish has to make that swim without stopping for lunch, it has to store up tremendous amounts of energy, and that energy is what we call “good fat.” The highest amounts of these good fats are contained between the skin and the meat of the fillet so be sure to eat that grey layer too! Scientists say that if you get together with your Salmon BFF at least twice a week, it will provide you with amazing benefits. Scientists say that if you get together with your Salmon BFF at least twice a week, it will provide you with amazing benefits. The omega-3 long-chain fatty acid content in Salmon — referred to as “good fat” — is responsible for some outstanding health outcomes. It calms you when you are inflamed. Yes, this fat will decrease inflammation in your blood stream, making your arteries more flexible, less prone to plaque buildup, swelling and trapping blood clots that cause strokes and heart attacks. What a breath of fresh air, this food can help decrease symptoms of asthma too. Arthritis and dementia are also exacerbated by inflammation, so thanks for standing by me while I age. It will also take care of your heart by helping ensure that the heart’s electrical functions stay in good order. It will calm you down when you need it, by helping decrease blood pressure, and it will pick you up when you are feeling down by helping prevent depression. Salmon will bring out the good in you by increasing your good cholesterol (HDL levels), which helps prevent heart failure. * Now that is what I would consider a great pal for life. All in all salmon has got to be one of the most worthy friends we could choose. Sure there are others out there that come close but wild Salmon is the topper when it comes to best food friends. Stop by Salty’s and our chefs will be happy to introduce you! *See more about my BFF’s health and heart benefits at alaskaseafood.org/health/facts/documents/heart_health_benefits.pdf.